Leif and I headed out to the MOMENTA evening show tonight to take in a fairly astonishing series of dances. For me, the highlight was an awe inspiring trio of Loie Fuller reconstructions: 'Night,' 'Fire Dance,' and 'Lilly of the Nile." My love of dance has grown over the past several years and I have discovered a new respect for historical works. 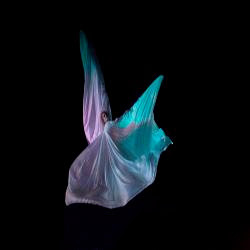 This was my second opportunity to view these pieces and Loie Fuller is my new dance obsession. Before our very eyes she turned to many coloured, shining orchids, to a wavering, flowing sea flower, and at length to a spiral-like lily, all the magic of Merlin, the sorcery of light, colour, flowing form. What an extraordinary genius! 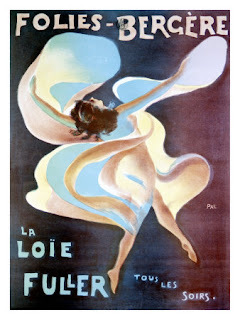 No imitator of Loie Fuller has ever been able even to hint at her genius!...I went every night to see Loie Fuller, from a box, and I was more and more enthusiastic about her marvelous ephemeral art. That wonderful creature--she became fluid; she became light; she became every colour and flame, and finally she resolved into miraculous spirals of flames wafted toward the Infinite. 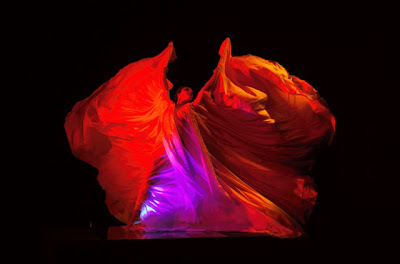 While I would never openly dispute the sentiments of the great Isadora Duncan, I have to admit Momenta came as close as humanly possible to capturing the visionary works of Loie Fuller tonight. It is hard to imagine these dances premiered prior to 1900...I assure you they have not lost their luster over time.